This recipe isn’t from the The Can’t Cook Book, it’s from a book I’ve had for a long time and love; it’s called Teens Cook: What to Cook What you Want to Eat by Megan and Jill Carle with Judi Carle. I love this book because as most of you know I can not cook. I’ve never be interested in it but I’m 23 and I need to learn how to cook for myself and for my boyfriend. 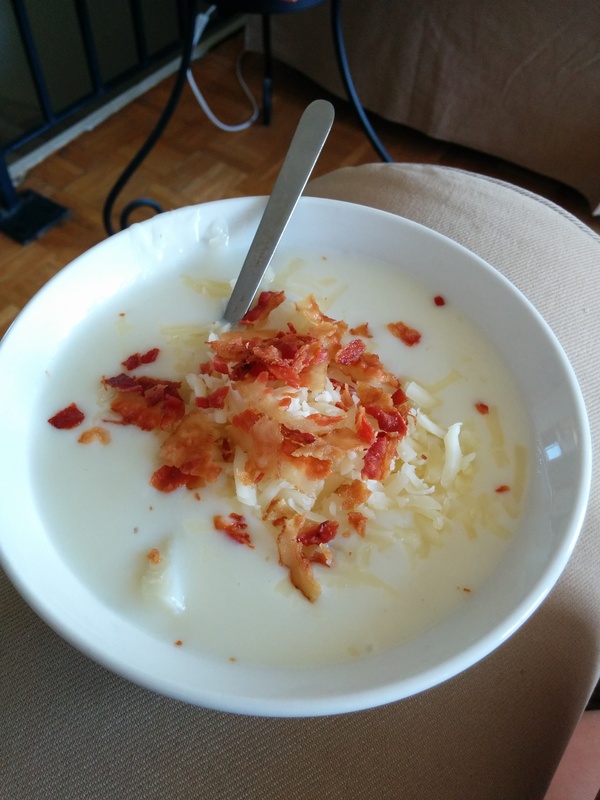 I’ve made this baked potato soup before but my sister was with me to help and guide me, this time I am home alone and craving this soup so I’m going for it. The first step calls for you to wash the potatoes and stab with a fork multiply times, simple enough! Now the potatoes have to cook in the oven at 375 degrees F for 45 mins. Now the next step is to let the potatoes cool and to peel them, I didn’t really have time for that because I was hungry! So I peeled them with oven mitts on and started the pot with the milk, flour and butter. Things are starting to roll! The next step was the easiest, you cut up the potatoes and add it to the pot and let it good for a couple more minutes! The last step to this is to grate some cheese and cook some bacon, done! You;re suppose to use cheddar cheese but I didn’t have any so mozzarella cheese was used! The best step to come in to put it in the bowl, top it with cheese and the bacon and eat it! This is the final product…. It tastes great, taste a lot like potatoes, you could only imagine! Let me know what you think of the soup or if you want I can post the recipe!